We’re turning dirty water into clean water. For many communities living in poverty, the local water source is a dirty pond or stream. Diarrhoea kills a young child every 90 seconds. By providing simple, low-cost water filters, We’re helping people like Bernadette (pictured) and her family, who face the risk of fatal disease every time they wash, cook or drink. Our water filters use just sand and charcoal. Effective, cheap and easy to maintain, they save lives. 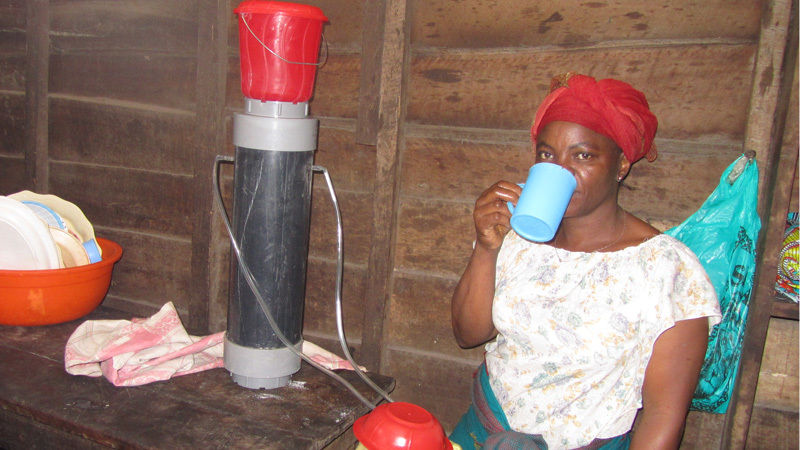 CAFOD's simple water filter transforms dirty water into clean, drinkable water. It takes just one hour for dangerous river water to filter through the sand and charcoal so that it comes out clean and safe to drink. By donating today, you can help more people in developing countries protect their health and their lives. Any gift will help those in need, wherever the need is greatest. Thank you. Water-related diseases are the most common cause of death for children under the age of five in hard-to-reach areas, and poor families become even poorer because they have to spend so much on medicine. Women face a stark choice. If they drink water from the dirty river close to home, their children could die. But if they walk to find cleaner water, they could be attacked. A water filter makes the local river water safe to drink. Wouldn’t a piped water scheme be better? Water filters are the only quick solution for families in small, remote villages. Humanitarian agencies are working to bring piped water to as many people as possible. That’s good news, of course. But small villages in very remote areas often miss out on piped water schemes because funds are limited and the cost per person helped is too high. Who builds the water filters? We wanted villagers to build the filters from scratch but they are made from PVC soil pipes, which are long and can’t be transported to the villages. So our engineers cut the pipes down to size and prepare the parts for assembly. They bring the parts to the villages and each family assembles their own unit and learns how to service it. It’s easy. They don’t need any special tools. How have people in the region reacted to the project? Do the water filters really work? Yes. The sand filters out dirt and harmful organisms. The charcoal removes odour and makes the water really clear. We have sampled and tested the filtered water and there was no E-coli in it. Over time, the sand gets clogged so the filtration is even finer. However, the best evidence is from the families themselves. Freddy and Bernadette used to spend a lot of their income on medicine because their children had severe diarrhoea so often. 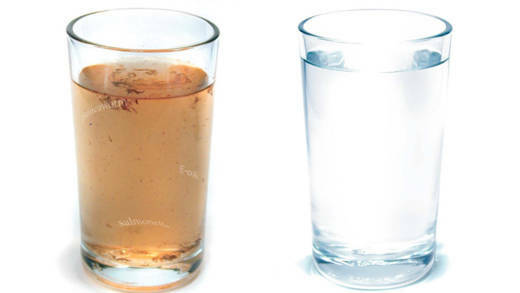 Just two months after getting a filter, they have reported an enormous change for the better. The children are rarely ill now, so they can go to school. And because Freddy and Bernadette don’t have to buy medicine, they can afford the school fees. 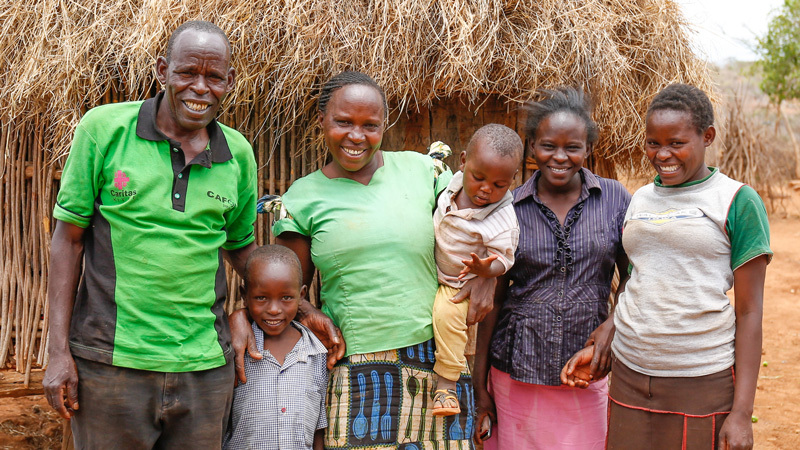 The family asked me to pass on their sincere thanks to CAFOD supporters. If you had more funds, what else could you do in the Democratic Republic of Congo? By planting trees in the Eastern part of the Democratic Republic of Congo, women would not be at risk of violence and abuse when they go to collect the firewood. 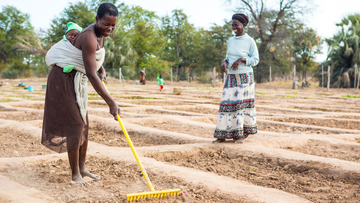 We could also train households to build a kitchen garden near their homes and teach them how to look after this. This in turn would make sure that children eat well and stay healthy. Make a donation and help those in need, wherever the need is greatest.